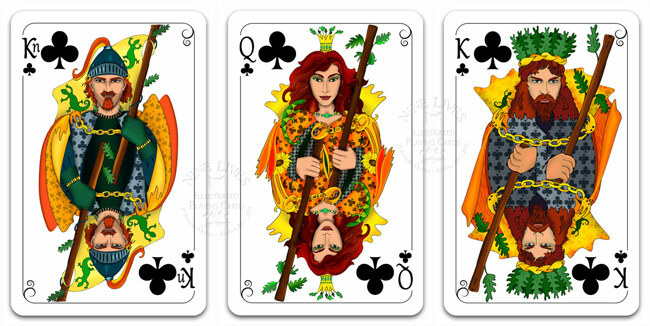 The artwork features the Kings, Queens and Knights from Nine Lives Tarot, where I have redrawn (and reversed) the court characters to match their corresponding playing card suit ... while subtly retaining some of their tarot persona. 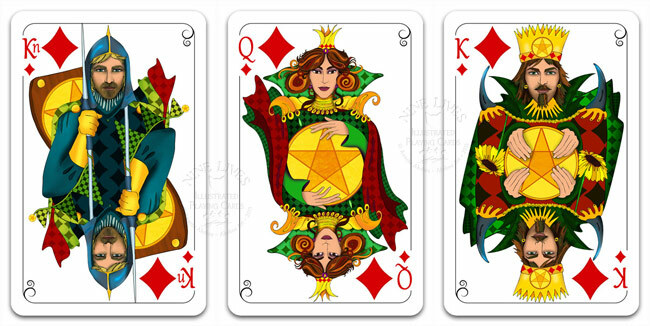 The 4 Aces have larger illustrations, combining tarot and playing card suit symbols ... whereas the pips follow a more traditional style with the suit symbols I designed for this deck. Beautiful artwork! So colorful too. You did a great job with it, thanks for sharing them. 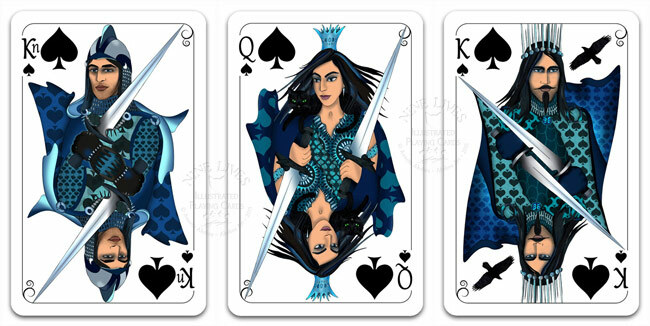 I entered the new design in the PCF Deck Design Contest over on playingcardforum.com, which is currently in voting stage (ends 19 Aug). I like your tarot deck and I was happy to hear about a playing card deck of yours. 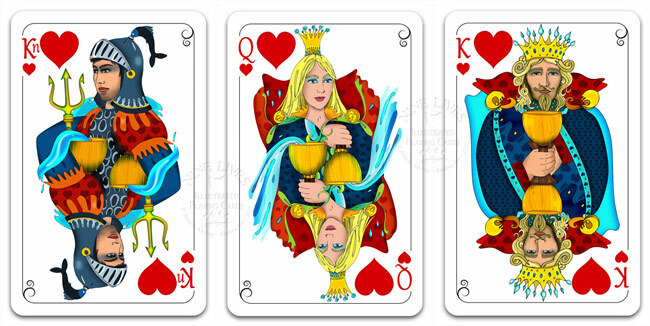 But, if I may say, although the courts are nice, taken from your tarot deck, the pips are just boring standard playing card design. For me, it does not add anything new (except the courts, but it is not enough to use it). 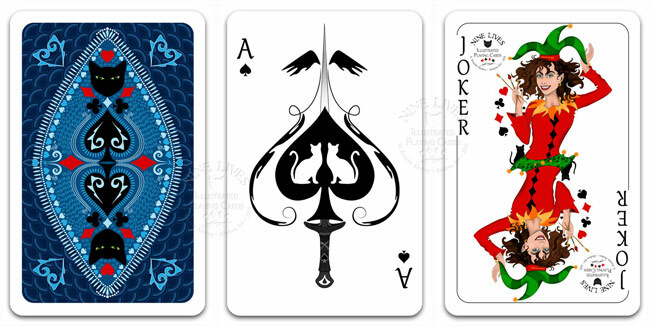 There is another thread here I just post it about colored playing cards, I will copy some text here, maybe to suggest a more vibrant and personalized variant of your playing card deck. Now I have a deck like this from a set with a book "Fortune telling with Playing Cards" by Sophia. 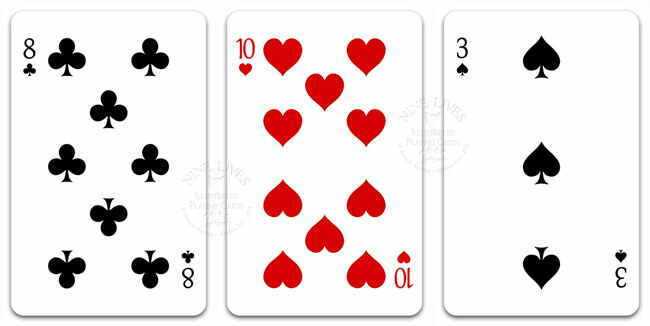 It is beautifully colored, the symbols are standard colored, black or red, but the background is different for each suit (clubs are dark purple, hearts are red, spades are yellow and diamonds cards are green). Oh, and also the borders are different colored. You can try new colors, like sky-blue for hearts and red for clubs. I think your colored deck can look great in a layout. Then I would want a pocket size and a mini for big layouts. Thank you Daphne - there's nothing wrong in wanting more colour in this world I'm glad you like my tarot deck and happy to hear your feedback. Congratulations for your winning deck!! Where is this Playing card forum, it is here? The suit colors indeed vary a lot, of course, there are different takes on it. Mod Note: Spam, affiliate links, email addresses, and links to other forums will be removed from posts, threads, or signatures without notice. Congrats frejasphere! Your beutiful deck deserves that win! Any news on its production timetable? Will it be KS-ed? As for color in cards, I'm all for that too! A number of other considerations have to be thought of - like the deck's playability, etc. Been reading stuff on playing cards lately, and have noticed a number of differences in terms of preferences between folks in the tarot-oracle world and the playing card world. It's actually quite interesting stuff. frejasphere, Congratulations on winning! so exciting.